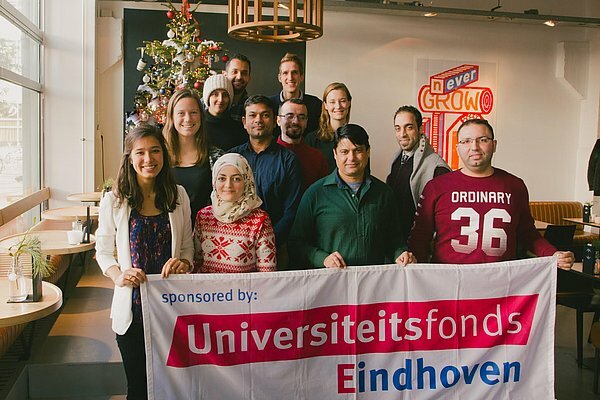 The TU/enable student initiative offers student refugees who are seeking a safe haven in the Netherlands the opportunity to take bachelor’s courses at the TU/e. This will allow these students to refine their knowledge and skills as a springboard to the Dutch labor market or a full bachelor’s or master’s program at the TU/e. The project will also generate valuable contacts for the international students, as well as involvement with and integration into Dutch society. Costs are associated with the project, for example for course material. Many textbooks can be borrowed – whether from the organizing students of from the university library. Because the demand exceeds the supply, however, it is also necessary to purchase some books. The University Fund is making a contribution to pay these purchasing costs, as well as the costs of transportation for the refugee students. Team TU/enable with a number of student refugees, with Ahmad Ibraheem on the far right.